880 – Exit on Marina Blvd. (East). Immediately after passing under the BART tracks, turn Right on San Leandro Blvd. Drive 1 mile to E. 14th St. Turn right, pass one immediate stoplight and the Medical Arts Building is the brown two story building. You can park anywhere in the next three driveways and by the adjacent San Leandro Hospital. 580 – Exit on 150th Ave, turn right and proceed to E. 14th St. Turn right and drive about one mile until you see signs for San Leandro Hospital on the left. After the hospital entrance, the two story brown building on the left is the Medical Arts Building. 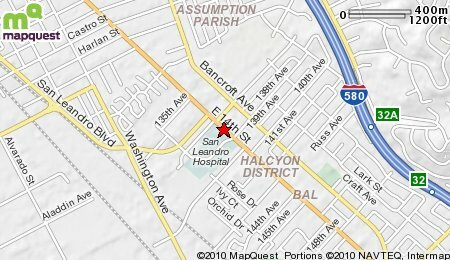 You can find parking on either side of our building, or at San Leandro Hospital. 580 – Exit at Fairmont/150th Ave, proceed north through the Fairmont intersection to 150th Ave. Turn left and go ½ mile to E. 14th St. and turn right. Drive 1 mile until you see signs for San Leandro Hospital on the left. After the hospital entrance, the two story brown building on the left is the Medical Arts Building. 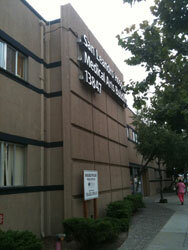 You can find parking on either side of our building, or at San Leandro Hospital.